Outfit: Etoile Isabel Marant Broderie Anglaise top (similar here), Karen Walker skirt (similar here) and See by Chloe low wedge sandals. After suffering from a year long of shoe drought, it's literally raining shoes. Or should I say sandals. I can't be happier. You know what I'm talkin' about. The kind of obsessive relationship women (ok, me) have with shoes does not extend to clothes. You've probably have heard enough of my rants (sorry!) about the lack of small sized shoes for abnormal individuals like moi. I've been like a woman possessed lately, muttering as I pounded away on the keyboard trying to locate a pair of mid heeled wedges. Just like these ones on the stunning Kate Bosworth's feet. The hubs was initially rather amused with my predicament, murmuring sympathetically whenever I ranted with ever increasing fervor. But he soon became rather alarmed when he spied his otherwise sane wife metamorphosed into a somewhat deranged shoe addict who may need a shoe exorcism performed on her. 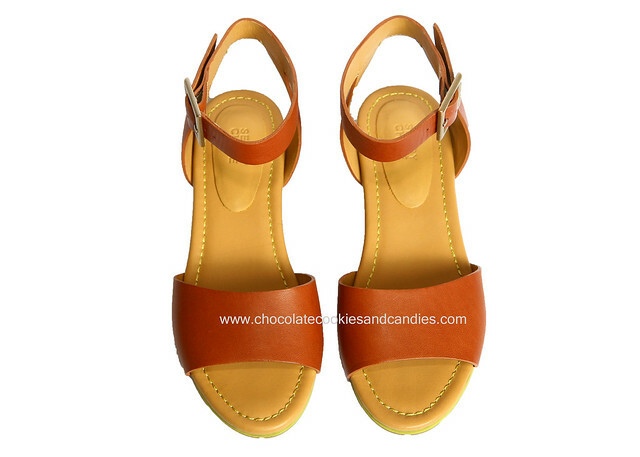 I would've never guessed these were See by Chloe sandals and relatively affordable. I was thrilled when I found out that these low wedge sandals were on sale. I normally steer clear of anything that wrap around my ankle but these have a way of visually elongating the legs. The leather is thick but far from uncomfortable. Comfort is non-negotiable with me. I have a lifetime of dealing with blisters and agonizing pain from ill-fitting shoes. 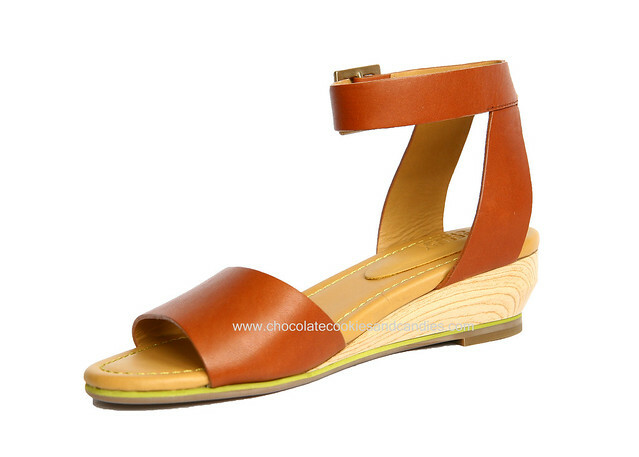 The wedge heel height is just 1.5 inches which gives a nice arch. The rubber soles are equally thick and perfect for rainy days as I often worry about slipping on wet surfaces. These sandals run pretty small. I actually took the next size up which fit perfectly. I can't deal with wooden clogs as I prefer cushioned insoles. These passed my school run tests which require a lot of running (we're always running late) and going uphill and downhill. They're available here for $219.99. Whew! My year long search for sandals are now over (I think.......). Cute outfit, and well done on finding the shoes! I own a pair of four-inch heels from see by Chloe and it is ridiculous how comfortable they are. I bought mine full price and they were pretty expensive but given how often I wear them, I think they have paid for themselves by now. I bet yours will last a long, long time. On an aside, how does Kate bosworth always manage to look so fresh? Love her style. This is the first time I've purchased a Chloe anything. I'm glad to hear that even 4 inch heels are comfortable. I'll certainly keep them in mind. I was initially shocked that these wedges were made in China but the quality is surprisingly good. Couldn't agree more. Kate Bosworth is one of my favorite fashion icons. I love the outfit, the inspiration pic and the sandals, as you know my feet are an perpetual source of whining! love the style n color! i'm a shoe person too but you already know tt! Love the simple look of these sandals. You sure are on the roll to buy some sandals after your shoes drought (that term is too funny). Glad to hear you are feeling bettter. I have been going through a similar sick phase that i got from my little one..sigh. Now all three of us are sick. We are more sick than ever since we have a child, a huge plus for being parents i guess. LOVE them way too perfect....ahhhh!!! A shoe exorcism! how funny, that really made me laugh. Fab Sandals that will go with everything. I love these! The ankle strap makes them really pretty and it's substantial compared to most ankle straps, which is a nice look. Glad you are finding so many pretty pairs of summer sandals that fit. I can imagine your plight. A GF of mine has the same but opposite problem of yours. She's an American 12 (and 6 ft tall) and most really pretty, cool shoes don't run that big. Hmmmm..... tan leather sandals with all black? Thanks for the inspiration. I bought a pretty pair of tan Chloe flats for this summer and didn't consider pairing them with my black dresses. I kind of hate you, as I just pulled the trigger on these even though I strictly told myself no more purchases for a long long time. :P Well, they might not fit if you say they run small! LOVE these sandals, you can pretty much wear them with anything. OH MY GOSH, THE SHIRT IS FABULOUS!!!! Love the cheeky lime detail - they make the shoes really stand out and they are beautiful. How do you always find the best stuff!!! I am borderline obsessed with an all black outfit! Love this one. Lol loved this post! I've been going through the same shoe obsession. In January I gave away a ton of shoes that were just collecting dust! I have since replaced them with new ones thanks to the amazingly affordable range by Zara! Love these Chloe ones, the colour (my fav), the heel length (easy to manouvere in) and the fact that they have straps and are peep toes - not a fan of toe cleavage! These sandals look super cute and comfy too. I too have stayed away from shoes with straps around the ankle but they're so popular with sandals this season. Thanks for stopping by my blog as well. Hope to see you around more often! You can run a marathon in these! Your pairing is perfect too, wish I could see them on you ;) I'm gald that you are better now..
it's a PERFECT basic sandal! and...like you said...the price is pretty AMAZING for see by chloe ;) happy walking!!! A great review. Comfort for me too is essential. They do look lovely. I have a habit of looking for things in the wrong seasons. I'm still trying to get a couple of winter tops and the shops are about a week or two from putting out their first spring/summer ranges! You made me laugh with the comment about dogs doing their "ahem" on the sidewalk in Paris. I was oblivious of course and my husband said he'd been quietly steering me around them as I took it all in! What a darling. Certainly wish he didn't need to watch out for them, yuk. Those are adorable sandals! Perfect for everyday. Hope you recover fully soon! I totally love the way you styled the sandals! I get into possessed modes as well when I'm utterly intent on tracking an item down. It's good you found them and glad to hear you're over the worst with your cold. I still swear by the old Chinese no eating/drinking anything cold rule which my mom taught me when trying to fight a cold. These sandals are amazing!!! LOVE them. The sandals are great, so perfect for year round! 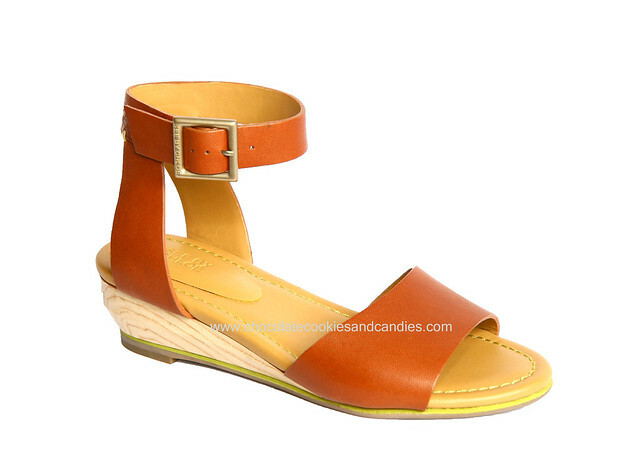 I'm glad you finally found the perfect low wedge sandals :) And it seems so versatile too. I hope you get better soon. glad you're feeling better now.. ;) love the sbc sandals.. perfect as they are i doubt your search is over, haha. i picked up something really similar recently, but without the wedge! i have totally fallen in love with those sandals! how chic are they!!! LOVE your outfit M. that skirt and top is just gorgeous! LOVE BUTTON ON THIS ONE! hope you're feeling better. Oh no! I hope you are feeling better! Get well soon. Your sandals look great! See By Chloe does such a good job- they look comfortable too. Love the outfit collage and agree that that brown is a wonderful contrast to all black! I have a pair of See by Chloe boots and I really like the leather! So glad you've been able to find all these great sandals in your size! It's raining shoes!! LOL! Wow, these are amazing!! What a great find! Oh no... A cold in summer!? Glad to hear you're feeling better.... And who wouldn't after finding these lovelies - they're practically begging you to get up and wear them with everything you own!